A week before the 2015 playoffs, the United States Hockey League's Sioux City Musketeers invited prospect Eeli Tolvanen to skate with them to see about signing him for the following season. He stood out among older players on a first-place team. "This little 15-year-old kid from Finland who was about 5-foot-6 at the time, he came to that practice and you could tell he was an elite playmaker," now-New York Rangers defenceman Neal Pionk said. "When he was doing that at that age, we could tell almost right away." "His growth just step-by-step happened quicker than most people see," said Jay Varady, Tolvanen's coach in Sioux City. "He's just been successful at a really young age in really tough challenges." Unlike when Sioux City got a first impression of Tolvanen and thought it a no-brainer to give up its first-round pick to sign him, Jokerit general manager and Hockey Hall of Famer Jari Kurri wasn't sure what to expect. Sure, Tolvanen lit up Finnish junior leagues, but this was a different level playing against men. "Since the first day, everybody was pretty clear that this guy is hardly a kid," Kurri said. "Everything went smoothly." "He's more like a well-rounded player than many people maybe understand at the moment," coach Jukka Jalonen said. "He can defend excellent, he's really physical, he hits hard, he has good vision on the ice. He can pass the puck over and shoot it, and he can play defence. He's a very sound player." Pionk didn't see Tolvanen's marksman-like shot in the spring of 2015 because a growth spurt hadn't happened yet. Two years in the USHL playing under Varady allowed Tolvanen to grow and adapt his game to an ice surface smaller than those in Europe while learning English and American culture. "It was really just Eeli's commitment to becoming a pro," Varady said. "He wanted to come over here, he did want to learn the language. He wanted to challenge himself on the smaller rink, tighter-checking game than maybe under-20 in Finland." Tolvanen's depth of experiences from the USHL to the KHL and the Olympics could speed up his learning curve in the NHL. He averaged more than 12 minutes in his first two games and was quick to get over the enormity of his leap to the next level. "Most of the nerves went away after the first shift," Tolvanen said. Before the organization's top prospect debuted, Predators coach Peter Laviolette said he hoped it was a seamless transition and pointed out that Tolvanen could simply fit in instead of carrying the load. Laviolette saw a jump in Tolvanen's play from Game 1 to 2 and expects the improvement to continue. "He looked like he was skating better, more competitive, more confident with the puck," Laviolette said Sunday in Tampa. "Every game he plays, I think he's going to get more and more comfortable with the speed of the game, with the level of competition." Other young Finns have raised the level of competition in the NHL, from Winnipeg's Patrik Laine and Florida's Aleksander Barkov to Carolina's Sebastian Aho, Colorado's Mikko Rantanen and Buffalo's Rasmus Ristolainen. Kurri thinks those players succeeding and playing a full season against grown men in the KHL readied Tolvanen for this. "He was facing tough games night after night," Kurri said. "He's a fast guy but he's pretty strong — strong in his skates, too. A lot people are surprised (by) that. He can play physical game. He can hit, too, and he wants to. I think this year really helped (him) to be a better player when he started facing the KHL teams night after night." Joining fellow Finns Pekka Rinne, Juuse Saros and Miikka Salomaki should help Tolvanen, the third-youngest player in the NHL this season. Though judging from his experience with Jokerit and Finland's national team, he fits in with teammates of all ages. "He gets well along with older guys, and they love Eeli and how he handles himself on and off the ice," Jalonen said. "He's quite a laid-back presence. He's quite cool, quite patient under the pressure and he doesn't panic. I think he's matured as he's aged." 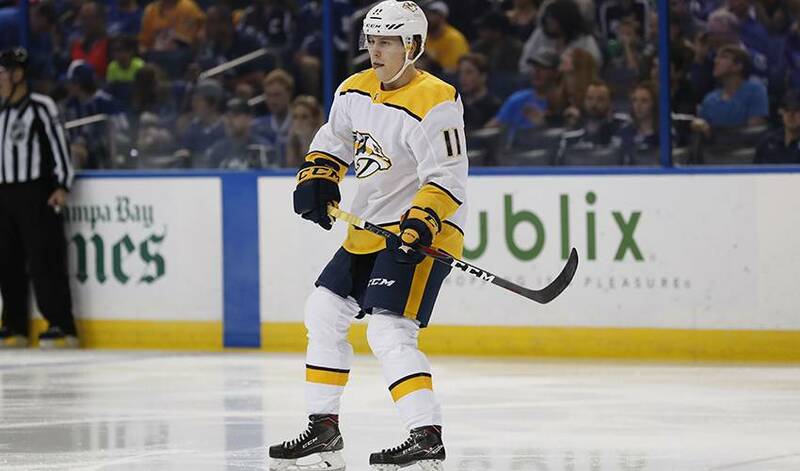 As Tolvanen ages and sharpens his all-around game, he is expected to be part of the Predators' long-term future with Johansen, Filip Forsberg, Viktor Arvidsson and P.K. Subban. He already stands out and has plenty of room left to improve. "He does it a little different than everybody else: where his hands are at, how he handles the puck and he just has that ability to get his shot off and it's deadly," Varady said. "The other thing is his speed, and he will play with a little bit of edge. He finishes checks, which sometimes surprises you with him, but he wants to get in on the forecheck, he wants to skate, he wants to compete."